« Morning Free Association: What Happened? 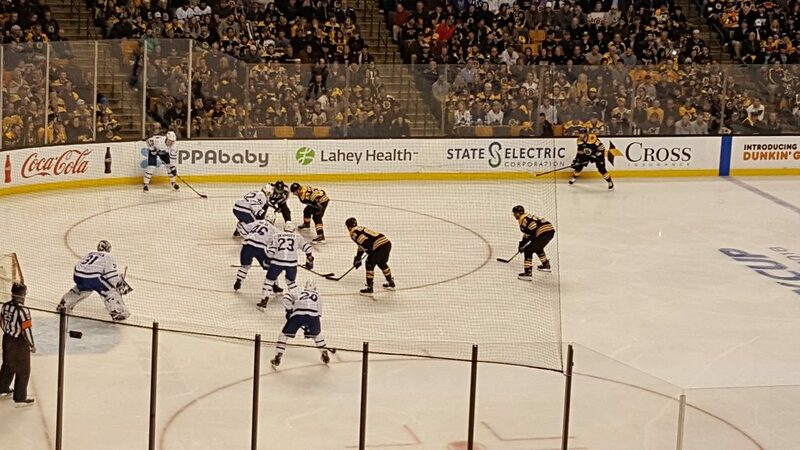 It’s game two between the Bruins and the Maple Leafs in thist first round of the playoffs, tonight on NBC. The Bruins are down by 1, with 3 to 6 games left. The Bruins underperformed in game one of this series, giving up a game in which they had home-ice advantage. They started out reasonably well, with Patrice Bergeron scoring first in a power-play on a feed from partner Brad Marchand. They’d had a bit of bad outcome losing a lot of faceoffs early on, but this trend turned around and each team ended up winning half of the faceoffs. Toronto would tie up the game before the end of the 1st period in 5×5 play. Early in the 2nd period, the Bruins got a power play on a Kasperi Kapanen high sticking penalty. The Bruins gave up a short-handed opportunity, with Mitch Marner in on Tuukka all by himself. Jake DeBrusk, in hot pursuit, would get his stick close to the back of Marner’s skate, and Marner fell over, (presumably tripped), sliding spectacularly into Tuukka. This resulted in Marner being awarded a penalty shot, which Tuukka failed to stop. The Bruins would not score on the power play, and never really got their mojo back – though the Mojo-Coyle-Heinen line was the only one which actually generated serious scoring chances. So do you think that Coyle would score on those opportunities? Meanwhile, the Bruins gave up several bad scoring opportunities, and allowed the Leafs to extend their lead by another 2 goals. On the plus side, there were no serious injuries, though Jake DeBrusk was involved in a couple of tough collisions, and is a game-time decision for tonight. What do the lines look like? Well, not bad. Sean Kuraly and John Moore are still injured, but most everyone else is back in the lineup. The one notable exception – defenseman Kevan Miller missed the last game. Matt Grzelcyk has been skating with Connor Clifton. Clifton seems a bit speedier and is not afraid to throw a hit. Moore and DeBrusk both skated this morning wearing red no-contact jerseys. David Backes was held out of the last game, allowing Karson Kuhlman to matriculate into the lineup. Backes will return to the lineup tonight. It is not yet clear if DeBrusk, Kuhlman, Heinen or Wagner will sit. UPDATE: Mojo out, Backes in. but he should be back soon. Hutch is the one who I most fear developing “hot goalie syndrome”. Garret Sparks traveled with the Leafs in lieu of Hutch. Hearing @RobGronkowski will be in the house tonight as the banner captain. Gronk always makes me smile. But now it’s hockey time! Tagged Boston Bruins, Playoffs, Toronto Maple Leafs. Bookmark the permalink. Out of all that crap, Krejci goes to the box?!?!?! Pretty petty call on Pasta. Disappointed, but I got no real problem with it. I need to see the replay again. It looked OK to me but you don’t always catch that stuff unless you’re watching it on TV. It was fine. Ref had a bad angle. Ummm, that’s AHL hockey, duh!